Hands-free light with red LED, neutral output, and an adjustable output. USB-rechargeable! Adjustable lens changes the beam from floodlight to spotlight. Dual fuel compatible and red LED! When shopping for the right marine flashlight, we found that headlamps are the perfect choice for use while on the deck or while you are in the engine room. Even more important is that the headlamp offers a red output option, which is the preferred method of maintaining a boater's night vision. A boating light is typically used for multiple purposes, such as up-close work with ropes or longer distance illumination. 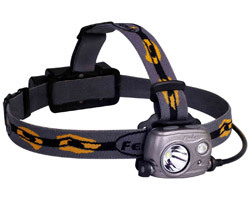 For this reason, most of the headlamps and boating flashlights we've selected have adjustable diffusers that alter the beam output between flood and spotlight. Why Not Just Buy a Dive Light? Another feature to consider, when shopping for the right marine flashlight is its waterproofness. This might be an obvious one, but it is important that you make sure your handheld light is rated at IPX-8, which means it is fully submersible up to two meters, for up to 30 minutes. Some might argue that a dive light would be a better solution; however, we found that diving flashlights typically offer a shorter beam throw than those offered by searchlights. Another important characteristic to consider is that many dive lights have a cool white output so that the light travels better through water. Searchlights, on the other hand, utilize a warmer more neutral output to cut through haze more easily. If there is a chance of encountering heavy fog, such as in the early mornings of a boating trip, we recommend sticking to the handheld boating lights we recommend over the underwater scuba diving lights out there. Just don't drop your light into the lake or the ocean! Rayovac offers some lights that float, if you're worried. A good marine flashlight for boats will include an anti-roll ring or it will have a finned design to prevent the light from rolling out of place when placed on a flat surface. Boats move and rock back and forth - you can't be having to chase after your light every time you hit a wave or every time another boat passes by. This is something that is surprisingly overlooked and should be considered when comparing different models, prior to making your purchase. Your marine flashlight should have a relatively long runtime, or you should be able to easily re-charge or re-power. While alkaline batteries are purchasable at any marina or shop, we all know that the lights that run on Li-ion cells are more powerful and are therefore worth the additional expense and inconvenience. As a workaround, we've included a lot of dual fuel flashlights that are compatible with both Li-ion rechargeable cells and lithium primary batteries. If you are in an emergency situation and your light goes out, simply pop a few non-rechargeable lithium batteries to get your flashlight back up and running. With these dual fuel boating lights, there is no waiting period while your flashlight recharges. 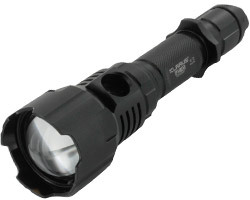 As we mentioned before, the best marine flashlight offers an adjustable beam to accommodate the varying needs of a boat. For up-close tasks on the boat itself, we recommend employing a separate, LED headlamp with a red LED to maintain your night vision more easily. For optional backup lights, check out our selection of EDC lights with an IPX-8 rating, which would work as a secondary illumination tool. Another route you could choose is the permanent search lights from GoLight. These boating lights feature impressive beam throws and brilliant illumination, but these spotlights are limited in their positioning. The versatility of a handheld marine flashlight is unmatched.